You’ve done great!!!! So far, my email has gone from 78% to 74%! I need to check what kind of dent I’ve made in my hard drive. 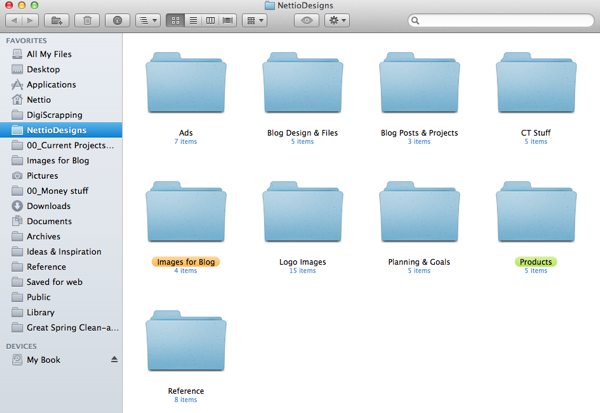 How do you get this view with folder size? I don’t think I’ve seen it on my computer. Is it from Finder window? That’s actually another program called What Size: http://whatsizemac.com/ which I purchased WAY back when I switched to a Mac. It’s not too expensive ($12.99) but you might try the Mac App store since there might be something similar for cheaper. It comes in handy when I’m trying to delete stuff! Doesn’t look as fancy as WhatSize, but might do the job! Looks good to me! I don’t use half the features in WhatSize anyway! I only ended up with it because it was long before the days of the Mac App store and it was the best I could find to the program I used in Windows. I do find it comes in handy though! So far, I’ve managed to update my bridge catalog with all the new tags I need, and all the italy photos are tagged as italy…now to sort them and delete the crap photos. Woohoo, awesome! I’m scared about deleting photos. Scrap supplies, no problem but photos have like, memories, attached. LOL! I hate deleting photos, so I’m trying to rationalize at least deleting the crap ones that are out of focus, in quadruplicate, etc. It’s HARD! I know! I have the worst time doing it too. I figure that’s where I’ll start as well, I’m so nervous though. There’s a reason I avoided my photos when I did this last year, LOL! The only reason I can’t put it off any longer is I have a coupon that expires next month for printing!!! I’m such a cheapskate that this is finally forcing me to get it done. YAY for you, Lynnette! 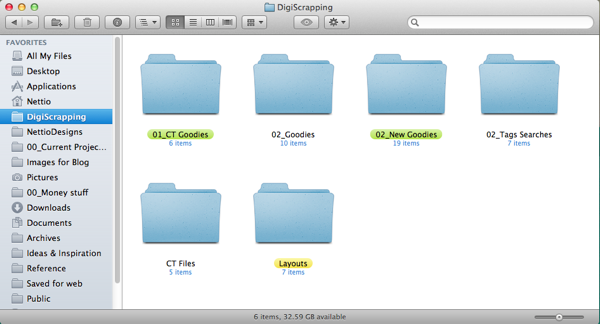 I finished organizing all my digi supplies (didn’t take too long as I’ve been keeping that up since September). Then I started purging–and ooooh boy I am merciless. I’ve gotten down to designers whose names start with G, lol. Hopefully will finish by the second day (which technically is today over here!) I’ve also kept track of my numbers so can’t wait to see how much my EHD has lost! Wooohooo for merciless purging, that’s what I like to hear! Here’s hoping your EHD has lost some digi weight! Wow, that’s awesome!! Your computer is getting slimmer than mine is right now, haha. I need to go through my downloads folder, re-organize my second EHD (I did the first one a week ago), and get all of my photos on my computer removed and put onto my EHDs. I also need to trim down the number of Scrapbooking kits I keep on my laptop (I keep favorites on the laptop so I don’t always have to use the EHD when I’m traveling or not in a position to use my EHD, but it’s getting very out of control and taking up too much space). So much to do! Yikes! Ooo, good luck! I keep way too much on my laptop which is why it’s bursting at the seems, haha. 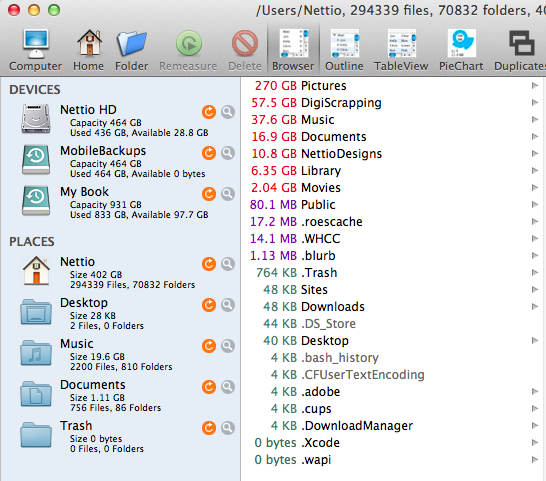 I have been purging in my photos folder and cleaned out my trash bin (there was a whopping 8 gb in there!) 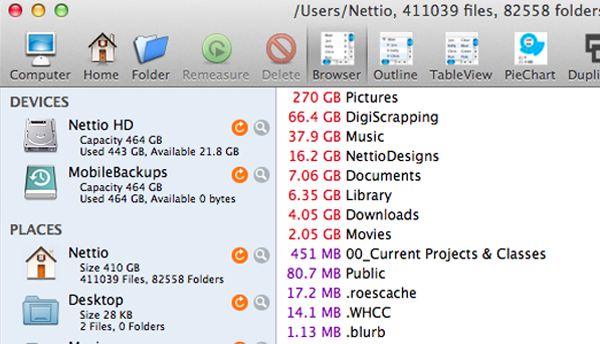 and I have already saved 30 gb! And I only did about half of the 2011 photos. I’m actually enjoying the process, even though it goes slowly. 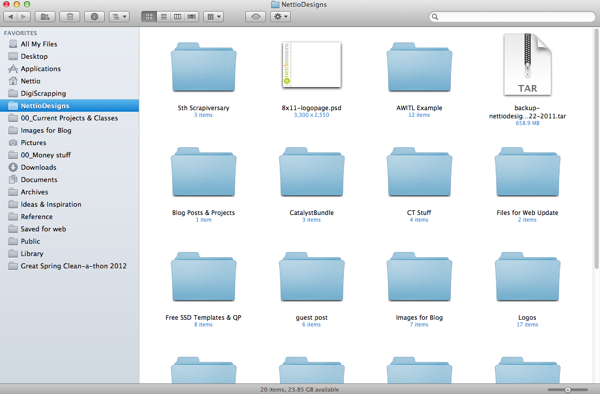 I might even tackle my goodies folder as well if there’s time left! Woohoo, 30GB, that’s awesome! Yeah my 2011 photos are calling me – I was terrible about deleting photos this past year. LOL, yes that’s true too. Although that is why I let the movers do the packing, haha. Last time I left and let Adam manage them all. It was fantastic. Ha! If only!! This is our 9th move in just under four years of marriage, and I don’t even have the military to blame! 🙂 Our move is ultra complicated as we are mostly moving to a storage unit and moving in with some friends while we continue to look for houses. It’s taking way longer than we thought! Oh yeah, that’s more complicated then! After moving with and without movers, I told Adam I never wanted to do a self-move again, haha. WAY too much work! 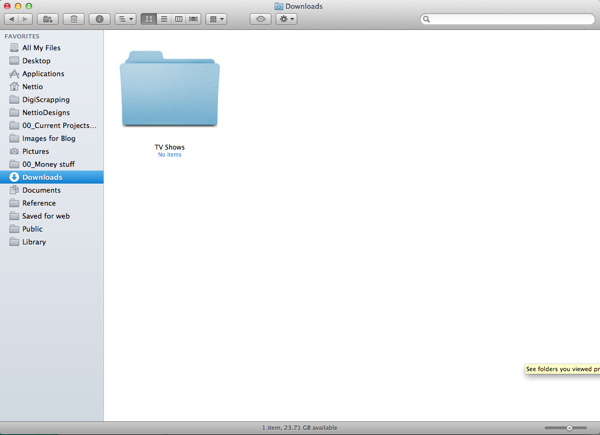 I wonder if it’s ok to delete iPhoto library. That would free up almost 200GB from my hard drive! I would double check that the photos are all somewhere outside of the library as well (in folders) but otherwise it’s probably fine. You might want to back everything up first though just in case, haha. Haha… that’s what I’m afraid of! I need to google about how to safely delete iPhoto library, but haven’t got around it. I do have everything backed up on EHD thru Time machine, so I should be ok. I did start adding the photos to Aperture library and I’m almost done with it. 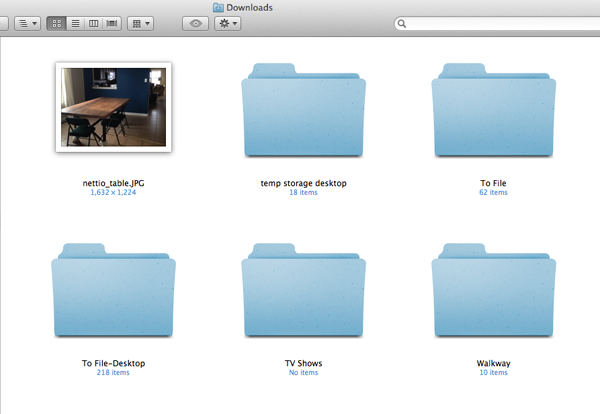 At least I had option to keep the photos in its original folders and not make copies of it like iPhoto. I ran into sooo many bad photos that need to be deleted! 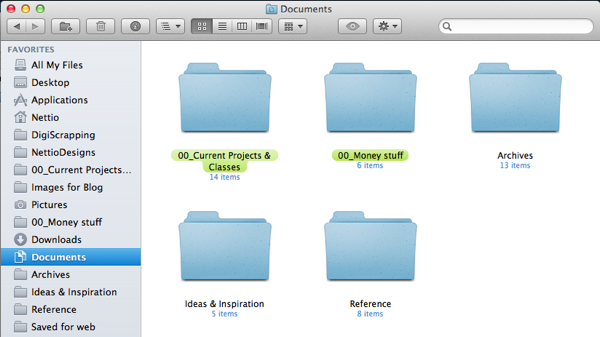 It will be a long project to go thru every folder! Woohoo! Yes, Aperture lets you leave your photos where they are which is one of the things I love about it.